Taken last December during my Tokyo trip. 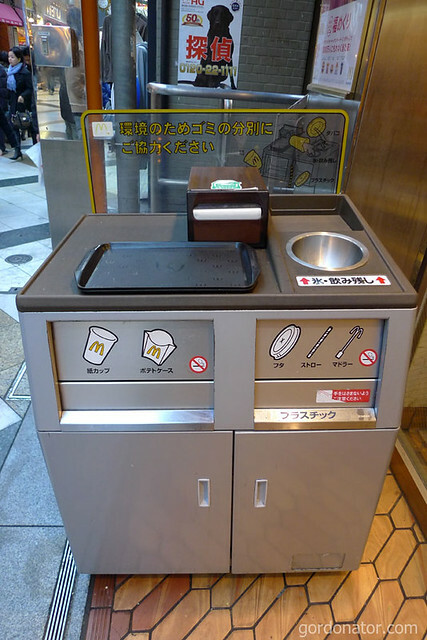 In a Tokyo McDonald’s restaurant, dinners clear their own table and dispose of their wrappers and cups accordingly to plastic, paper or ice cubes/leftover beverage. I like this practice very much. I really hope Singapore can follow something like this but I know it’s impossible. It’s an eyesore every time I see people who do not clear their table after their meals at fast food joints. It’s not something very difficult to do, there are no plates, cups and utensils to wash. All one need to do is to throw the wrappers and such into the nearby trash bin. A simple act like this is a big step towards a gracious society. I’ve always cleared my place at fast food joints. I thought they were pretty strict about that in Singapore. I remember the caning controversy here in the States when a delinquent from here was going to get caned for stealing traffic signs. The news pundits were having a field day on how strict it was in Singapore. Where “even dropping a gum wrapper on the street could get you a heavy fine”. By the way. They let the kid go & he came back here ….. where he was put in jail for attacking his dad after arrival. They should have caned him.